Eurasian otter populations strongly declined and partially disappeared due to global and local causes (habitat destruction, water pollution, human persecution) in parts of their continental range. Conservation strategies, based on reintroduction projects or restoration of dispersal corridors, should rely on sound knowledge of the historical or recent consequences of population genetic structuring. Here we present the results of a survey performed on 616 samples, collected from 19 European countries, genotyped at the mtDNA control-region and 11 autosomal microsatellites. The mtDNA variability was low (nucleotide diversity = 0.0014; average number of pairwise differences = 2.25), suggesting that extant otter mtDNA lineages originated recently. A star-shaped mtDNA network did not allow outlining any phylogeographic inference. Microsatellites were only moderately variable (H o = 0.50; H e = 0.58, on average across populations), the average allele number was low (observed A o = 4.9, range 2.5–6.8; effective A e = 2.8; range 1.6–3.7), suggesting small historical effective population size. Extant otters likely originated from the expansion of a single refugial population. Bayesian clustering and landscape genetic analyses however indicate that local populations are genetically differentiated, perhaps as consequence of post-glacial demographic fluctuations and recent isolation. 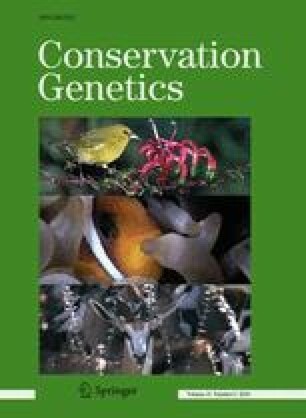 These results delineate a framework that should be used for implementing conservation programs in Europe, particularly if they are based on the reintroduction of wild or captive-reproduced otters. This study has been partly supported by the Italian Ministry of Environment, Department of Nature Conservation. We wish to thank the ConGen program (funded by the European Science Foundation) and the Danish Natural Science Research Council for financial support to C. Pertoldi (grant number: #21-01-0526, #21-03-0125 and 95095995). P. Hajkova was supported by the Grant Agency of the Academy of Sciences of the Czech Republic, grant no. KJB600930804 and by the Ministry of the Environment of the Czech Republic, grant no. VaV-SP/2d4/16/08. VaV-SP/2d4/16/08. We thank everybody who helped in sampling collection. In particular, for France, L. Lafontaine wishes to acknowledge all people who provided otter samples for this study, and/or belonging to the following networks : SFEPM, LPO, ONCFS (DRD CNERA-PAD, F. Léger, P. Migot, D. Serre), ONEMA, FDAPPMA, Parcs Naturels Régionaux de Brière (X. Moyon), du Morvan, MNHN (G. Véron) and Muséums d’Histoire Naturelle of La Rochelle, Orléans, Toulouse, ENV Nantes, ADEV, GMB, Syndicat du Bassin du Scorff, Station INRA Moulin des Princes, APPMA Plouay, Base du Douron, EDENN, AREMIP, LPO Marais Breton, Fédérations Départementales des Chasseurs and officers from the Office National de la Chasse et de la Faune Sauvage SD12, SD17, SD22, SD29, SD33, SD35, SD40, SD44, SD56, SD85. The careful revisions done by three anonymous referees, and additional comments by the Associated Editor, greatly aided us to improve early versions of this paper.